Unfortunately, I have some very sad news to share. 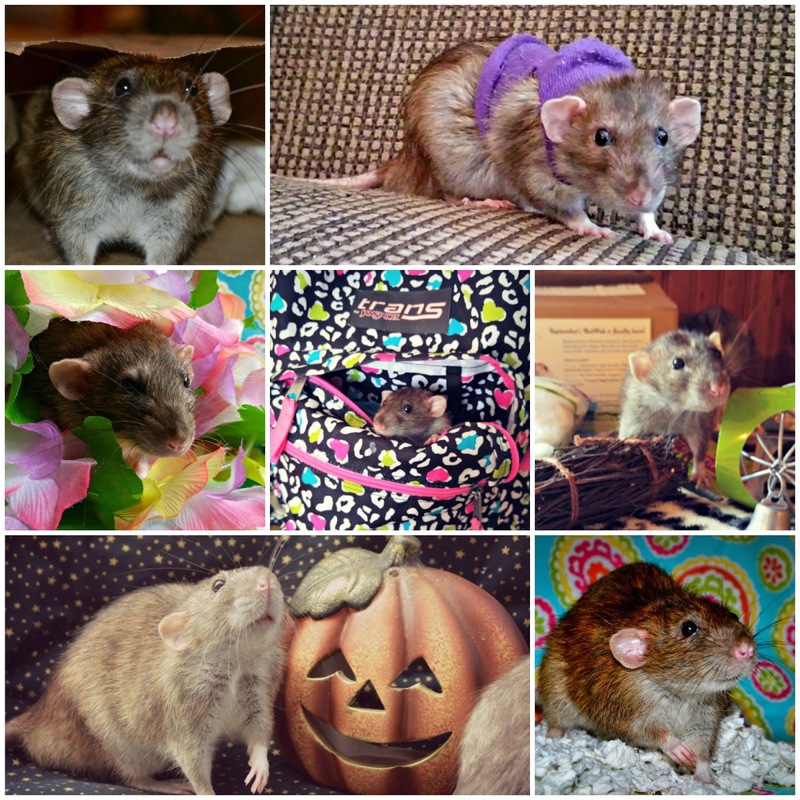 As you may have guessed from the title of the post, our sweet little Jack the Rat has made his way to ratty heaven. He was a sweet, mischievous, and always hungry willing to eat food little guy and he sure will be missed here. If you're surprised by this news, you aren't the only one. Jack lived to a nice age of 2 years and 5 months old. That's pretty good for a pet rat I think. I know my rats are getting old, and it started showing the past few months. But honestly, I wasn't expecting Jack to leave just yet. On Monday night when I took Jack out of his cage, I noticed that he did seem thinner than usual. He's always been the fat one. I also noticed that instead of running around on the bed like he usually does, he just found a spot to lay and relaxed quietly. It wasn't extremely alarming, but just slightly concerning. He ate his dinner fine and drank some water too. After that, I thought about taking him to the vet this week and went to sleep for the night. Well, yesterday when I got up I checked on the boys and he was much worse. He was laying still on the bottom floor of the cage. I picked him up and he was very still. I wrapped him in a small towel and put him in my lap, deciding on what I should do next. I could tell by looking at him, his time was very limited. He was knocking on death's door. I suspected he had a few hours to live, max. At that point, I decided I would sit with him cradled on my lap until his soul left his little body. Jack passed away about an hour later peacefully while I held his paw and stroked his fur. I was torn on the decision of letting him pass at home or rushing to the vet's office. I honestly didn't think that we would have made it there in time and so I'm kind of relieved to have been able to spend his last few moments peacefully at home with him. So, yes I'm kind of surprised as this was a bit unexpected. I let his brother, Gus, say his goodbyes and then we had a little funeral in the field. Gus seems OK for now but I'll be keeping my eye on him. The only bad thing about having a pet rat is that their lives are far too short. And they seem even shorter when you adopt one as an adult. I am happy to have called Jack my friend and pet for 1 year and 8 months. Rest in peace little buddy - I'll miss you. Bye bye, little cutie pie ... hope heaven is full of cheese! You are totally cute and we know you'll be missed a lot. I'm really sorry about Jack. I'm not sure why, but I thought rats lived longer. That was a very nice tribute, collage and video. Their lifespan is about 2 years, or more if you are lucky. WE are so sorry about Jack.We know you all will miss him. He sure was a cute guy. We are so sorry about Jack. What a sweet one he was. Loved his video. We are so sorry for your and your family's loss, Ann. It sounds like you did the perfect thing...just being with him and letting him peacefully go at the end. RIP Jack. Thank you Jan. That choice started to eat me up a little. But I knew by the time I got myself and my kids ready and all in the car, it could have been too late. Run free sweet Jack, run free. So sorry for your loss Ann. Awww we're so very sorry for your loss. My daughter has gerbils, and those little guys each have a personality all their own and you can easily become attached to them. I don't doubt for a minute that you had a close attachment to Jack. Big HUGS for you Ann. Rest in peace, Jack. My favorite pet when I was a kid was my rat, Susie. She was so smart and affectionate. Hoping you're surrounded by yummy food and lots of ratty friends! Yes, we sure were surprised and very sad to hear that news. We can only imagine your sadness. Jack always made us smile when we saw his photos. He was one lucky rat to have you love and care for him. Love and hugs to you from all of us. Run free Jack, your fans loved you lots too pal. 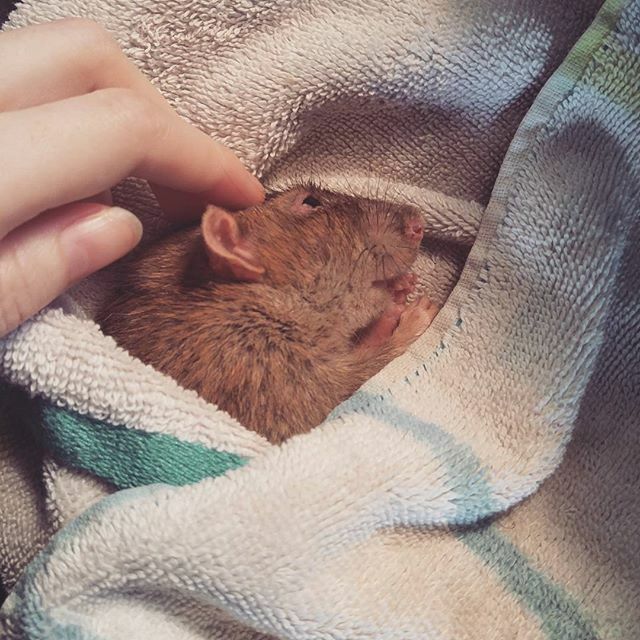 We are so sorry for your loss, Jack seemed like a very sweet rat. His life was too short. Purrs and prayers from all of us at Doggie and Kitty Caperz. We didn't know Jack but you loved him and miss him, so we came by to leave a warm hug, purrs and paw taps of comfort. I've come to pay my respects to Jack. Gone too soon. I'm sending comforting purrz to those he left behind. I know the girls must be broken up. It seemed like Niblet lived forever compared to Jack. Thank you CK. The girls are OK... I think I was sadder than them. My youngest just says that "Gus is lonely now". Nibblet actually had a shorter life. She didn't quite reach 2 years old, but almost. I had her for about the same amount of time though... 1 year 7 months. She was also a little older when I got her. Maybe 4-6 months old. I am very sorry for the loss of Jack. Their lives are too short. I am so sad to read this. Jack was my first rat friend and he changed the way I think about them. I'm so sorry. Give Gus a kiss from us. We are so sorry to hear about Jack. We send you lots of comforting purrs. I'm so sorry. Purrs to you and your family. We are so sorry, Ann. Jack sure was a cute little guy, and so full of personality. Sending purrs and prayers for you all, especially Gus. I'm so sorry Jack had to leave you but I know you have a lot of good memories and I bet he'll be watching over you from the other side. Their lives are just too short. Oh Ann I'm so sad to hear about Jack.....what a cute little guy and no doubt his life was so much happier with you than it may have been otherwise so you have a lot to be proud of. I think spending his last moments with you - feeling the love and not having all the activity of a vet's office was a more PEACEFUL and easy end for him too. It was love he knew at the end. That's as it should be. I'm sorry for your loss - Jack was such a sweetie and from your photos always seemed to be up for some fun with his family. Sounds to me like you did exactly the right thing to let him go peacefully and loved at home where it was quiet and familiar. We are so sorry to hear of Jack's departure. We think you handled everything with grace and honor to the sweet little guy. So sorry about your Jack! That is so sad. Jack we are sending purrs and prayers of support to your family so you can run about and have fun until that day we all meet again. I'm glad he passed peacefully in your lap. Poor little guy. I had no idea rats had such short lives. I'm sure it was a good one living with your family. I hope Gus is doing okay! So sorry to hear about Jack. Dogs have short lives, but rats are extremely on the short end. We are so sorry fur your loss. It was good dat you kuld be there at da end. Mommy sez it helps more than we think. We's sendin' lots of purrayers and hugs. I'm so sorry, Ann. I'm glad you had the chance to spend those last hours with him giving him love and comfort as he passed. My thoughts and prayers are with you. Beautiful video and photos. Jack was such a special guy. I'm glad you wrote about what happened with him and that you were able to spend his last moments quietly together. I know how hard it is to decide between rushing to the vet's or allowing a beloved pet to die at home. It sounds like you made an excellent decision and I'm sure Jack was very comforted by your being with him up until his last breath. My heart goes out to you and your family, especially Gus. Thinking of you and hoping many warm memories of fun times with Jack bring you much comfort along with knowing you provided him with the best home and most love possible. I am so very sorry. It is so hard when we lose them, but that is the price we are all willing to pay to have the joy they bring to our lives. I had no idea their lives were so short. Jack was one very lucky guy to have the time he did with you. I'm so terribly sorry for your loss. Ah bless, what a shame.